This is a Guest Writer submission from VrinTheTerrible. First, the obligatory warning: THIS POST CONTAINS STAR WARS: FORCE AWAKENS SPOILERS. READ ON AT YOUR OWN PERIL.THIS POST CONTAINS STAR WARS: FORCE AWAKENS SPOILERS. READ ON AT YOUR OWN PERIL…. Ok, enough space for spoilers…now, on to the post! She lives “right down the block” from the Millennium Falcon her Heroes Journey teacher’s (Han) home the way Luke lived “down the block” from ‘old Ben Kenobi’. Wouldn’t Han and Leia would recognize her if she were their daughter? Directs Finn to where the tail gunner seat – meaning she knew where it was immediately. A good storyteller who’s looking to cause buzz and discussion leaves a lot of red herrings and some of what I noted above will absolutely fall into that category but one thing is for sure: She’s a Skywalker. The lightsaber wouldn’t have called to her if she weren’t. Everyone I’ve read on the internet seems intent on arguing one version or another of those indicators but despite what I noted in the indicators above I don’t think she’s the offspring of Leia/Han OR Luke. Stay with me, I’m going somewhere here. As of the end of Force Awakens, The First Order has just lost its big weapon, the Starkiller base. Right now, Episodes VIII and IX do not have a “big bad”. Sure, General Hux, Kylo Ren and Supreme Leader Snoke will have to be dealt with but I think it’s safe to say they will have something in store for our heroes. Something bigger and badder than the Starkiller base. Let that marinate for a moment. One of the common comments/jabs/rants at the Force Awakens is that it takes too much from the previous series. In fact, the Starkiller Base is essentially an upgraded Death Star, right? Well, now that we know that they “use the old to tell the new” we should begin to think along those lines. We know Ben Organa-Solo (aka Kylo Ren) was being trained by Luke. We know he is seduced to the dark side by Supreme Leader Snoke. We do not know why Ben turned. It took Senator Palpatine years to grow Anakin’s hatred and jealousy before he could turn him into Darth Vader. Presumably, Snoke did not have that much time to turn Ben else Luke, his teacher, would have stopped him. That means there was likely an acute cause – an instant turn. What if Supreme Leader Snoke approached Ben Organa-Solo with the idea to clone Darth Vader? It’s easy to see a Sith Lord spinning the “Ben could have his grandfather back” tale, is it not? Installing the Vader hero worship we see displayed during Force Awakens? Just as easy as it is to see Luke/Han/Leia being horrified at the thought of it. They would go to put a stop to it but what if Snoke’s plan was underway by the time Luke/Han/Leia heard of it – and the first of the clones is already alive! But something has gone wrong in the cloning process due to the damage done to Darth Vader’s genetic material in his funeral pyre. Their “proof of concept” clone was a female! That’s right: I’m asking what if Rey isn’t Luke or Leia’s daughter- what if she is a modified clone of Anakin himself?!?! 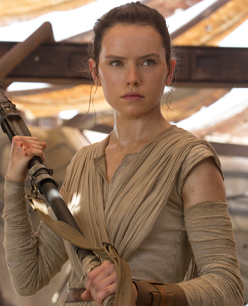 It provides the character of Rey with a TREMENDOUS range for “who am I” growth – and I mean TREMENDOUS! I’m just like you – I haven’t seen the script for Episode VIII. I have no idea if this is right. But I hope it is. VrinTheTerrible likes comics (especially the Flash), sci-fi and everything else geek. He believes There Can Be Only One and its corollary There Should Have Been Only One. He’s been known to have entire conversations using nothing but movie quotes / references and song lyrics. Some say he’s one step away from Darmok and Jalad at Tanagra. Some people are right.